From one of the leading figures in the field of second language acquisition and second language teaching, While We're on the Topic... offers an up-to-date overview of six principles underlying contemporary communicative language teaching. 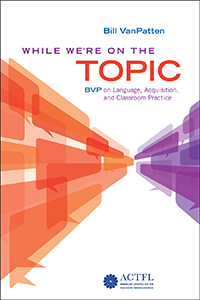 In a conversational style, Bill VanPatten addresses principles related to the nature of communication, the nature of language, how language is acquired, the roles of input and interaction, tasks and activities, and focus on form ("grammar"). Each principle is informed by decades of research yet all are presented in a manner accessible to veteran and novice educators alike. This book is a must read for all interested in 21st century language teaching. With special features such as Foundational Readings, Discussion Questions and Food for Thought, "I..." statements for self-assessment, and While We're on the Topic reflection boxes that invite the reader to ponder related topics, this book can easily be used as the foundation for any course on contemporary language teaching.